When we were in school, a lot of us thought that history was all about battles, assassinations, dates, political leaders, political parties, scandals, exploration, more dates, inventions, discoveries, industries, and still more dates. Some students thrived on this but for many of us this was B-O-R-I-N-G! I don’t know too many folks who like memorizing dates and events. It is sort of like the multiplication tables but less useful most of the time. It was when I got into museum work that I began to realize that history is really all about the people involved in making it. Today, this may seem obvious, but for hordes of students who graduated from high school in the 1950s, 1960s and 1970s dates and battles were the things to know. Take the Battle of Gettysburg, which was fought in and around the town of Gettysburg, Pennsylvania from July 1 to 3, 1863. This is a battle most Middle School students learn about. Many of the names reflect the topography of Gettysburg, for instance “Little Round Top”, “Culp’s Hill”, and the “Peach Orchard” and these same places are where much of the heavy fighting took place. The battles are described in detail with times and troop movements. I know some people who really enjoy that type of history, but for me it is not as interesting as knowing why some of the soldiers and officers acted the way they did. Who were the men (and sometimes women) involved in this battle? One of Geneva’s best known participants in the Battle of Gettysburg was Col. Eliakim Sherrill. He died on July 4, 1863 from a mortal musket wound received on July 3, 1863 on Cemetery Ridge. Many men died that day so what sets Eliakim Sherrill apart from the rest of the fallen soldiers? It is his story. Each man who died at Gettysburg had a unique story; the trouble is we seldom hear their stories. Because Col. Sherrill was a local, well-respected person it is easier to tell his story. Eliakim Sherrill was born in Greenville, NY on February 13, 1813 and attended public schools there. In 1832 he moved to Herkimer County and later married Emily Eldridge, daughter of Judge Eldridge of Madison County. In 1838 Sherrill moved to Shandaken, then a very wild area of Ulster County, and opened a tannery. Eventually he entered local politics and served as a major in the militia. He joined the Whig party and was elected to the 30th U.S. Congress (1847-1849) and later to the New York State Senate (1854 to 1855). In 1858 he moved his family to Brooklyn. Two years later the family moved to a farm in Geneva, the 200 acre Thomas Burrall estate on North Street. 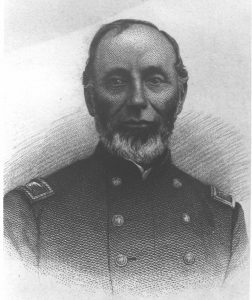 When the Civil War broke out Sherrill formed the 126th New York Infantry and became its first colonel. The 126th was involved with the defense of Harper’s Ferry where Col. Sherrill suffered a gunshot wound through his lower jaw. He was captured and later paroled returning to Geneva to heal. When the wound did not heal he went to a dentist who discovered one of Sherrill’s teeth had been knocked out by the bullet and lodged in his tongue. He returned to active duty near the end of January 1863. During the second day of battle at Gettysburg, Sherrill was ordered to replace a fallen commanding officer. The following day, July 3, while leading his brigade Sherrill was mortally wounded. It is said that 10,000 people attended his funeral in Geneva. Newspapers depicted Sherrill as an excellent farmer, an honorable man of his word who accepted the task of raising the 126th Regiment when others turned the duty down, a man respected by his men as a brave soldier and a kind man. 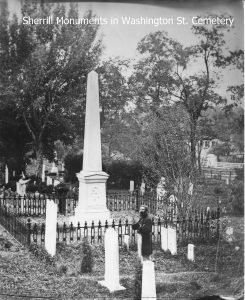 He was buried in Washington Street Cemetery with a large obelisk to mark his grave. In history classes the event often overshadows the people involved. I vaguely remember studying WW I in school. I remember the descriptions of “trench warfare,” the countries which participated, photos of soldiers in uniforms and a lot of dates and battles. Two things made a bigger impression on me than the dates, battles, and boundaries of countries. The first thing is a diary from a local man, Francis Herendeen. The trigger for WW I was the assassination of Archduke Franz Ferdinand of Austria. The Herendeen family was in Europe when the Archduke was killed. Francis’ description of the event (only a brief mention) and his thoughts (he saw no reason to hurry home and thought the assassination would not cause much trouble for him or his family) were much more intriguing than the dry dates and battle locations. 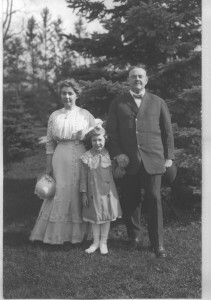 (Read more about the Herendeens and the summer of 1914 – Part One and Part Two). The second thing was my grandmother and aunt who told me stories of how WWI affected them and their country, Belgium. My grandmother’s vivid stories brought the time period to life for me in a way no course work could. It is descriptions of this nature which make me say that it is people, who bring history to life and make it interesting and memorable.